If you expect me to walk through life like this...... Get REAL. I've gotten a few e-mails about the video that I posted. Why get mad? I took time to explain to these gentlemen about the process involved with relaxers and why I chose to go natural. Should you have a conversation like this with someone, please don't get angered at someone that doesn't know. Introduce these men to your story on why you are going natural and allow them the chance to gain insight on the situation. Guess what, they are still thinking about everything we talked about. I'm taking everything I learned to have a different approach to men about hair. Educate and inform. Furthermore, if the deciding factor of a relationship is based on LOOKS alone, he needs counseling. I walk this Earth as the QUEEN I am. LOVE me or LEAVE me. I'm still going to do ME. Yesterday I had the privilege of being able to ask my childhood best friend and his roommates how they each felt about MY hair. I've been missing because I have been working on my YouTube channel. Of the three, two concluded that they did NOT like my hair at all. This is part of my response.Can I be upset at them for stating their opinions? No, but I will say that words hurt. I'm glad that we all were able to have this conversation. Can we blame society? Partially. The reason that I say this is because if you are an adult and live in the US, we have freedoms. The first being able to express ourselves freely without being JUDGED. SLAVERY mindset still exists even today. Read "Hair Story: Untangling the Roots of Black Hair in America" if you haven't already. I agree that it is hard to appreciate something that you are not accustomed to. Christopher stated that "I need to see more women with natural hair". True, if more women would wear their hair natural, I do believe that black men would appreciate our hair. LACK of EDUCATION is to blame as well. When you grow up and you are taught at an early age that your hair is "bad", it is no wonder that there is hesitancy when you do decide to go natural. I’m not being disrespectful to our ancestors BUT what has been taught has been passed down for generations and that is all that we KNOW. WE have the ability to accept changes within our own lives. EDUCATION and KNOWLEDGE is the leader of progression. Hard to do that without either. I’m not trying to make excuses or place blame on anyone or anything. There are many factors and this will be a debate that will probably continue on this Earth even after I’m long gone. I want change. It begins with me. When I have children, I want to pass my values and beliefs to them. My girls are going to be natural until they are old enough to make a decision about their hair. But as children, I will nurture and care for their hair. As they age, they will realize that others may be different but I believe that change begins with ME. I’m not going to say that these guys didn’t learn from this conversation and you do have to keep in mind that this was amongst 4 people. This is just ONE perspective of many and I had the opportunity to be able to record and publish this. 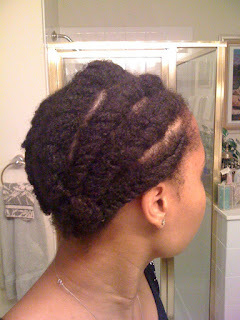 They understand about HEALTH risks, COSTS, and INCONVENIENCE of relaxers. But they have a new insight on women and what WE as African Americans go through to keep our hair up. I’m hoping that Chris Rocks movie “Good Hair” is educational and informative. All three earned themselves a ticket to see this movie. I’ve recommended a few books to them as well. But everyone has their preferences and opinions. I RESPECT that. I love my hair. Any male that I am involved with IS and WILL appreciate my hair and ME for who I am. Nothing like a man that loves, adores, and cherishes his QUEEN. Hello everyone! I know it seems like forever since I have signed on. It’s been 1 year to date on August 10, since my last relaxer. I would’ve never thought in a million years that I would be where I am at today. It’s not all about the hair. It’s about discovering yourself as an individual. I’ve taken this experience to step outside of my “comfort” zone and have challenged myself to be a better person everyday. Physically, emotionally and spiritually. I would like for my life walk to be of many experiences and challenges. Those of which that I am able to share and perhaps enlighten and inspire others. The past year has been great! I will share with you some things that I have learned specifically about hair. I try not to get caught up in the hair typing systems. Imo, it’s just another degree of separation within our already divided community. Embrace your natural texture and have fun with your hair! I’ve never had so much fun creating different hairstyles every week! I have the cannot keep my hands out of my hair syndrome. That’s why 99% of the time, I’m all twisted up. I am not a product junkie. Or at least I don’t think that I am. I try something, don’t like it, give it away. fortunately for me, I was able to find a great product line without going broke first. But for me all I need is a Shampoo bar, Deep Conditioner, and some Hair Milk. Simplified. Nothing else that’s it! How do I dry my hair you ask? Precious sun rays and air. I have the best hair on the planet. No one can tell me otherwise. My hair has a personality of its own! Yep Kinks, Coils, Curls, Twirls, mixed with a lot of funky fun! I ♥ my hair!!! I take care of my hair as if it is a delicate flower. Each bend of every curl in my precious crown needs to be handled delicately. Patience. From my hair cut to the growth that I have attained I’ve found myself to be more patient with everything in life. Not just my hair. Everything always works itself out I don’t stress or worry. Just breath. Strength. My hair is a firm representation of this word and an avid description of myself as an individual. I seek strength everyday. Side note: Anyone that has a MacBook that is familiar with the iPhoto program could you please e-mail me and let me know what I need to do to create a collage? I would greatly appreciate it! Thanks in advance! At this point I looked in the mirror. Hurt by the fact that I can no longer get my hair relaxed without making that long journey home (3 hours) I began to just wait it out. After all, I’m not incompetent when it comes to styling. So for the next 3 months, I just braided the sides of my hair, wore buns, blow dried my out straight, flat ironed, curled, and anything in between. I remembered one morning during this time period that I looked in the mirror and began to cry. The reason? The reflection that I saw wasn’t of me. I bombarded myself with questions of why was I going through this frustration with my hair? What do I REALLY look like? This was the part that hurt the most. 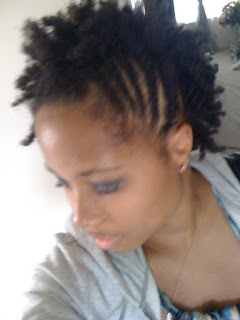 I had NO clue what my natural hair texture looked or felt like since we haven’t met since my childhood. Mentally I made a decision then and there that I was not going to continue to get my hair straightened because I was ASHAMED. To not know what I really look like? LaToya are you serious? Yes, part of me was missing. I never shared my experience or thoughts with anyone during that time because it is a VERY personal experience. I’m sharing now because it is what I was going through at that particular time. Then I decided to do some research. YouTube, fotki, any and everywhere I could find pictures, listen to someone else’s experience, information on hair products, and the list continues. I frequent Atlanta and was able to go to Urbanbella in Buckhead. The ladies there were very friendly and helpful with helping me select products for my hair. I purchased a few items, but I was AMAZED at the beauty in each crown of these beautiful ladies!! Wow, is this what I have to look forward to? I certainly hope so! November was the last month of my frustration. I say this because as you should be already aware is that natural & relaxed hair do NOT get along at all. So, I was experiencing a lot of breakage. It also didn’t help that I was using a lot of heat to try to keep it straightened. So on November 21, 2008, I quietly snuck into the chair of an barber and asked him to cut all of my hair. No tears, no sadness, nothing. I looked in the mirror afterwards and stared. No, my cut is fine. I’m fine. I’m looking at myself because I cannot believe that this is ME. I don’t have much hair but I love the little bit of hair that I do have. I had So many thoughts going through my mind that I cannot even explain. I get back home, lay down to relax, and think. No more worries about my hair. I purchased headbands. For what? No clue because I didn’t have enough hair to push back. But I’m at ease because I shampoo my hair almost everyday. No worries about how to style it. Air dry. What blow dryer? Nope. Simple. Showers are a lot more fun! Rain showers too! Too bad you all couldn’t see the looks on my all of my co-workers face! I wish I had a camera to capture that moment because when I went it to work the entire place FROZE literally because everyone was so shocked, all over my haircut. 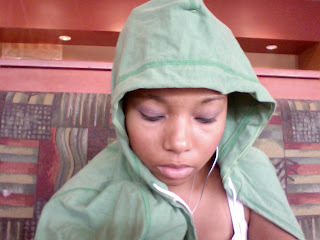 I’m saying all of this because August 10, 2008 was my last relaxer. So it’s almost a year. Just thought I’d take a walk down memory lane. Now when I look in the mirror, the reflection I see, I smile, because I know it’s of ME!!!! !